« Real Story behind CIA Director, General Petraeus’s Resignation. Hello Europe! What about Gypsy Holocaust? Keep off United States, warns Morten Thorsrud of Norwegian Insurance company, ‘IF’. ^^Insurance companies are warning Norwegian companies not to invest in the United States: The reason is a legal system in which the threshold to go to litigation is small, and the compensation amounts are enormous. -The United States is a huge and lucrative market, but it is undermined by a judicial system that has gone over the track, says Morten Thorsrud at the “If” insurance company to today’s Business. “If” is among the companies that insures Nordic companies against lawsuits in United States. Thorsrud says that the company currently has over 100 civil cases for clients in the United States. Since 2007, “If” paid out nearly $ 1 billion in damages in cases where Nordic companies have been sued.^^. Norway police officially apologise for 1942 Oslo deportation of Jews. 532 sent on ‘Donau’ ship: ^^532 Jews were taken to their deaths to Stettin and Auschwitz in November 1942. Only nine returned. In a historic move, Norwegian police issue a formal apology for their role exactly 70 years ago. The DS ‘Donau’ left at 14:55 for Stettin in Poland. Trains were used for onward transport to Auschwitz-Birkenau….Over 300 police officers, led by police inspector Knut Rød, took part in the arrest and deportation operation of Norwegian Jews that year on orders of the Gestapo. About 2,100 Jews total lived in Norway at the time….According to historian Mats Tangestuen at the Jewish Museum in Oslo, the youngest child deportee was four months old….“I wish to apologise on behalf of the Norwegian police and those who had dealings with the deportation of Norwegian Jews to the concentration camps,” newly appointed director of police Odd Reidar Humlegård says to Dagsavisen….His expression of regret today also comes following Labour (Ap) Prime Minister Jens Stoltenberg’s public apology for the deportations on 27th January, the UN’s International Holocaust Remembrance Day^^. This is not the picture of holocaust. But that is precisely the point of putting it right after the news of apology issued by Norway police for an act committed by their predecessors in the force some 60 years ago. The above picture belongs to same era and is a grim reminder of the Bengal Famine of 1942-43 that claimed anywhere between officially accepted 3 million up to 5 million recorded by other sources. At that time the famine was blamed on cyclone and war. These two factors did have an effect on winter harvest and excessive focus on war efforts respectively; and could be held contributory to colossal tragedy. But later it became clear that famine was a direct result of the callous policies and actions of the Colonial Administration of Bengal. Amartya Sen [Poverty and Famines]showed that food availability in Bengal in 1943 was higher than in 1941, when there was no famine; and people did not die for absolute shortage of food, but were not given access to food available. Causes of famines invariably look at the supply side with little or no attention paid to demand side pulls and role played by skewed purchasing power. Administrative actions can directly influence demand side factors for worse or better. 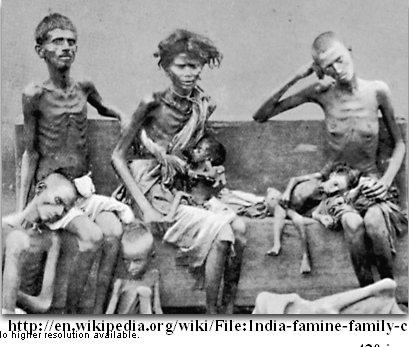 Colonial administration made the Bengal Famine worse causing the colossal death toll. Madhusree Mukerjee’s book :Churchill’s Secret War: The British Empire and the Ravaging of India during World War II, looks at archival material to lay the blame squarely on Churchill for what happened in Bengal. Churchill had infamously said: ^^The Indian people brought this upon themselves by breeding like rabbits; why isn’t Gandhi dead if the famine is so bad?^^. Has one ever heard of British apologising for Bengal Famine? Or for that matter Churchill’s family making amends for his callousness? Then there was famine in Ukraine in 1932-33 when over 4 million perished: ^^Over four million people starved to death between the fall of 1932 and the summer of 1933 in Ukraine and the Kuban, an administrative unit of the Russian Republic in the northern Caucasus populated largely by Ukrainians….in 1931, more than 42 percent of Ukraine’s total harvest was taken, an exceptionally large levy that would disrupt a production cycle already seriously shaken by the forced collectivization and de-kulakization begun the year before. Many kolkhozes were forced to give up some of the seed required for the following year’s crop, seriously undermining future yields^^. The policies prosecuted by Stalin directly resulted in the deaths Ukrainians on genocidal scale. Where is the apology or even acknowledgement from what is left of Soviet Union? The holocaust refers to the targeted killings of some 6 million Jews by Hitler’s Nazi state. But wait a minute. Were not over half million Romani or Gypsies too exterminated by Hitler? Are there any holocaust memorials dedicated to gypsies? One only hears of unending stories of Jewish holocaust, as if everything else doesn’t matter. Jewish Holocaust has become the most famous liturgy in the temple of Human Rights that has almost no place even for mention of other equally colossal tragedies. Post world war two, Jews are doing well in all countries where they are present. Anti Semitism is punishable in many countries. Palestine was carved by displacing Arabs to create a special homeland for Jews- Israel. Israel continues to treat Palestinians the same way Hitler treated Jews. Jews today are far remote from the horrors of holocaust. Yet, holocaust is linked to them, and only to them. Gypsies are still continue to suffer in countries they live, are still hounded out, and do badly on every count of human development index. Yet, there is not a word about Romani or Gypsy holocaust. These same countries of Europe, who are willing to apologise at the drop of a hat for their complicity in Jewish holocaust -a commendable gesture indeed, are absolutely silent about their complicity in Romani or Gypsy Holocaust. They in fact continue maltreat this community. Tragic, but there is politics even in holocaust. Does UN Holocaust Day remember and honour Gypsy victims? Does UN have a day for remembering other genocides from the past? This entry was posted on 2 December 2012 at 17:14 and is filed under Bengal Famine 1942-43, Gypsies, Holocaust, Romani People, Ukraine Famine 1932-33. You can follow any responses to this entry through the RSS 2.0 feed. You can leave a response, or trackback from your own site. About time someone noticed these huge and telling discrepancies. Thank you Sadanand.